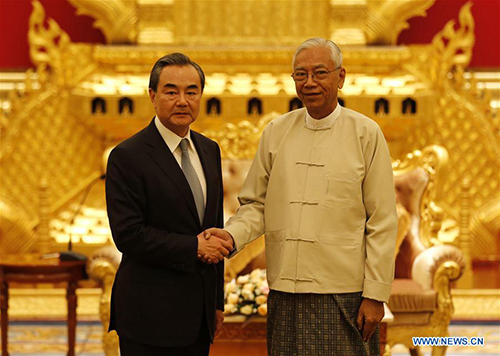 Myanmar stands ready to join hands with China to speed up the development of the China-proposed Belt and Road Initiative, Myanmar President U Htin Kyaw has said. Proposed by China in 2013, the initiative refers to the Silk Road Economic Belt and the 21st Century Maritime Silk Road, aiming at building a trade and infrastructure network connecting Asia with Europe and Africa along the ancient trade routes of Silk Road. U Htin Kyaw, while meeting with visiting Chinese Foreign Minister Wang Yi here on Sunday, said the initiative has vigorously pushed forward international cooperation, and promoted the common development of countries. The Myanmar president said Myanmar also appreciates the proposal of building a China-Myanmar economic corridor, and intends to actively integrate with the Chinese side over the project. On the Rakhine state issue, U Htin Kyaw appreciated the Chinese stand and said Myanmar is willing to negotiate with Bangladesh to solve the problem according to China's three-phase solution proposal. For his part, Wang said China and Myanmar have been friendly neighbors for decades, and became comprehensive strategic cooperative partners since the start of the new century. In the future, the two countries will build a community with shared destiny together. The Chinese side regards Myanmar as an important cooperative partner on the joint implementation of the Belt and Road Initiative, and is willing to discuss the building of China-Myanmar economic corridor based on Myanmar's development guidelines and practical needs, so as to promote common development of the two countries, Wang said. The Chinese side believes the Myanmar government has the wisdom and capability of pushing forward domestic peace process, and China will continue to offer support at Myanmar's request, Wang added. On the same day, Wang also met with Myanmar's Commander-in-Chief of the Defense Services Senior General Min Aung Hlaing. The Chinese top diplomat said he was under instruction to visit Myanmar soon after the successful convening of the 19th National Congress of the Communist Party of China. And it is intended to send out a positive message that China takes developing relations with Myanmar as one of its diplomatic priorities, Wang stressed. While speaking highly of the role Myanmar army has played in the country's development and stability, Wang noted that the army is also a staunch force in promoting China-Myanmar friendship. Wang noted that China-Myanmar military ties have stood the test of time and hardships and now constitute an important and indispensible part of China-Myanmar relations. On the Rakhine state issue, Wang said China hopes the three-phase solution proposal can contribute to the proper settlement of the issue. Min Aung Hlaing, for his part, said China is not only Myanmar's friendly neighbor but also the sincerest friend. China has been providing strong support and assistance for a long time to Myanmar to help maintaining peace and stability, and promoting economic growth, he said. Myanmar army is willing to continue playing an active role in carrying on the fine and friendly tradition of the exchanges between the Myanmar and Chinese armies, so as to usher in a new era of Myanmar-China friendly relations, Min Aung Hlaing said. Myanmar appreciates China's position on the Rakhine state issue, he said, adding that Myanmar army will make unremitting efforts to seek the solution of the issue at an early date.